Mastery of ECG interpretation is achieved not only by pattern recognition, but equally importantly, by a clear, practical understanding of how electricity moves through the heart and how disruption of that movement manifests itself via ECG tracings. ECGs for Beginners, written by one of the world's most respected electrophysiologists with over 40 years experience of training clinicians, will provide cardiology and electrophysiology trainees with an easy to follow, step-by-step guide to the topic, thus enabling them to both understand and interpret ECG readings in order to to best manage their patients. Packed with over 250 high-quality ECG tracings, as well as management algorithms and key points throughout, every chapter also contains self-assessment questions, allowing the reader to test themselves on what they've just learnt. All kinds of arrhythmias will be covered, as well as morphological abnormalities such as atrial and ventricular problems. Importantly, normal ECG readings will be presented alongside abnormal readings, to best demonstrate how and why abnormalities occur. 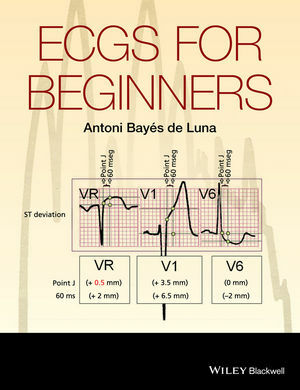 ECGs for Beginners is an essential purchase for all cardiology and electrophysiology trainees, as well as being a handy refresher guide for the experienced physician.